My daughter is trying to raise toxin free toddlers. The chemicals in many plastics and toys worry her, and she wants to avoid colors, dyes and pthalates along with other noxious ingredients whether or not they're approved by the FDA. We've collected plenty of tried and true home made recipes for craft paints and play modeling dough for kids that are safe, made with kitchen ingredients. 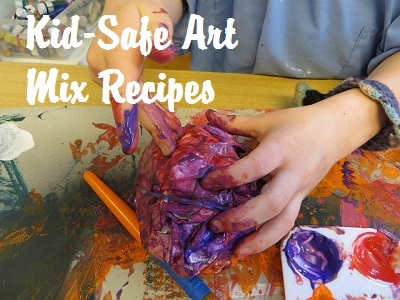 Here are our favorite recipes for crafty art mixes that have been delighting the children in our family for more than 35 years: home made safe play dough, face paint, finger paint, soap bubbles and a nontoxic, safe and lickable Stamp and Sticker Glue Recipe. add food coloring for the color you want. Some folks like to use Kool-Aid as the coloring - it also adds a scent. If the dough is too moist, add more flour. Store in covered containers and keep cool - stores for a few days. Mix sugar and cornstarch in pan. Mixture will boil, then thicken. Cook about 5 mins. Remove from heat; cool. Separate into 4-5 cups. Add food coloring a drop at a time. Add a drop of dish detergent in each cup to make clean-up a breeze. Paint on paper, cardboard or posterboard. For very young toddlers you'll find this finger paint recipe as smearable and messy as the commercial finger paints, but much safer if they lick their fingers. Combine a small amount of natural food color (available at health food stores) with a couple tablespoons of corn syrup. Mix well to blend in the color, then let kids paint. Mix together gently and pour into bottles.